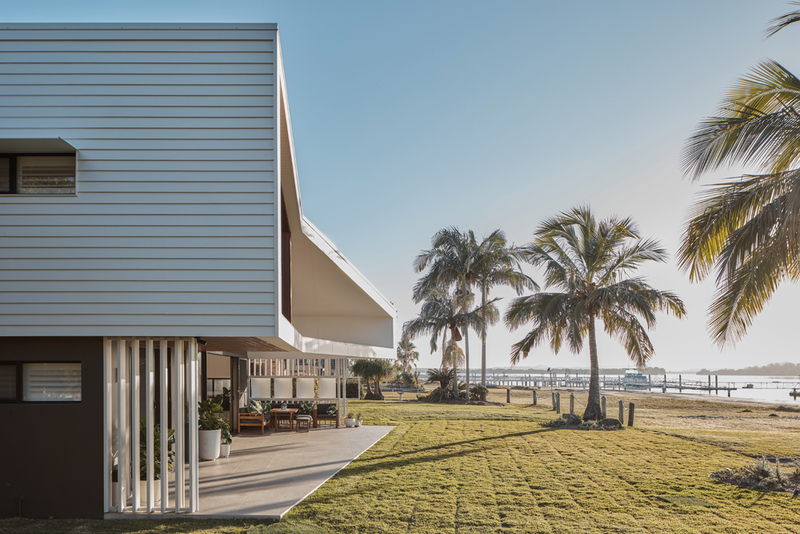 Cabbage Tree House showcases deliberate design and breathtaking views sweeping from Moreton Bay to North Stradbroke Island. 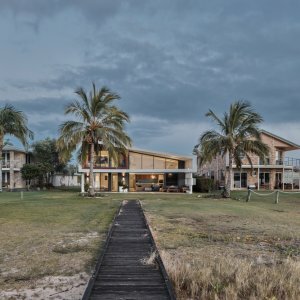 Located in the north eastern region of the Gold Coast, the property resides in a seaside fishing community. 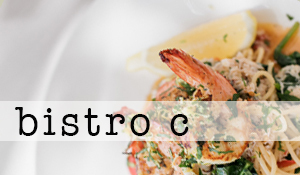 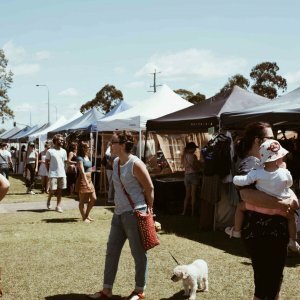 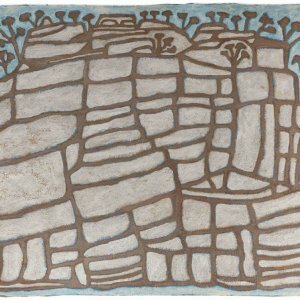 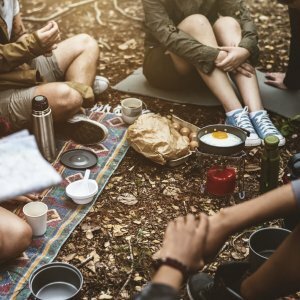 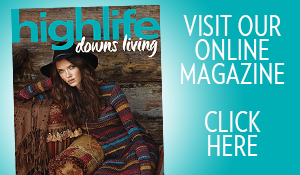 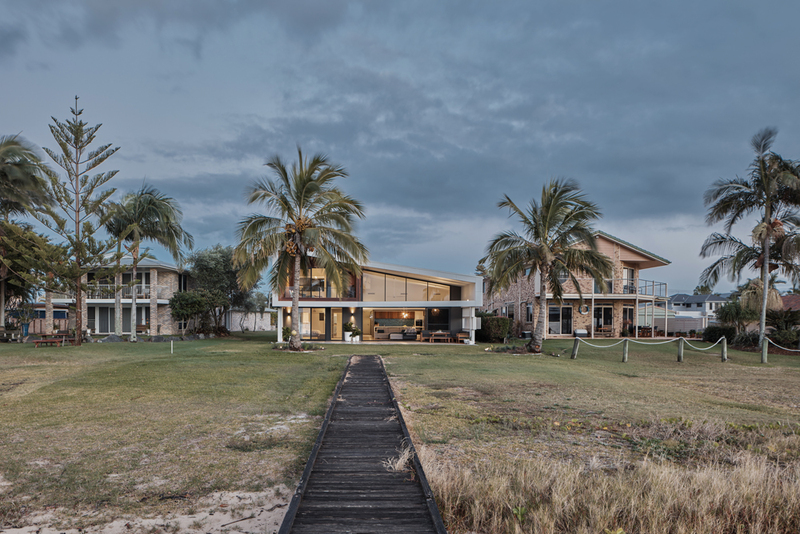 The location of the estate provides endless adventures from fishing, bushwalking and kayaking to crab potting. 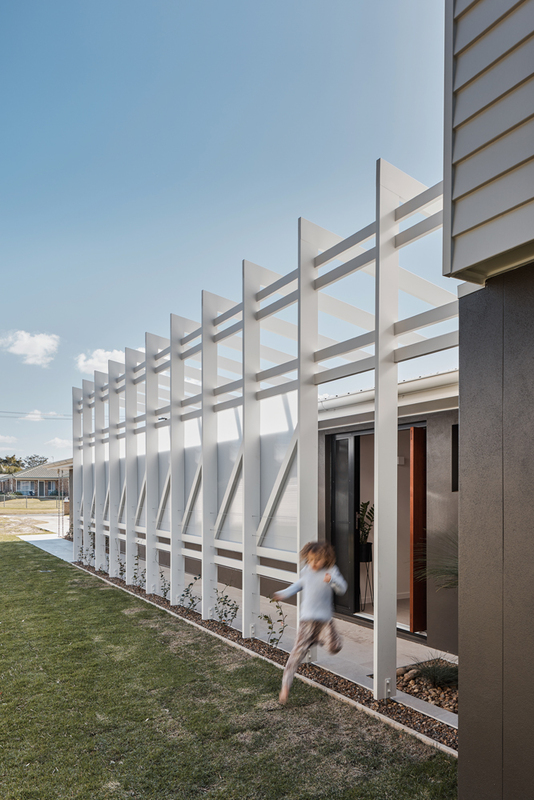 The architectural project involved injecting a sense of heart and familiarity into an existing single storey brick home that had been neglected since the 80s, creating a new sense of heart for the home. 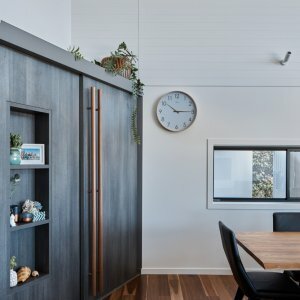 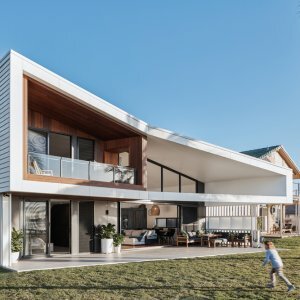 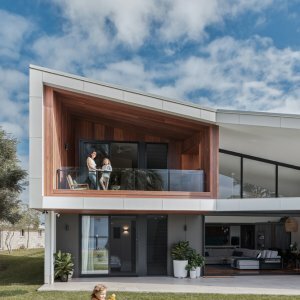 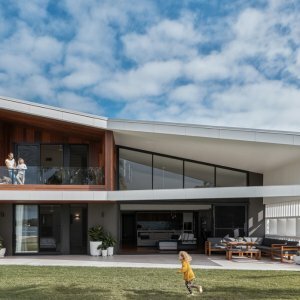 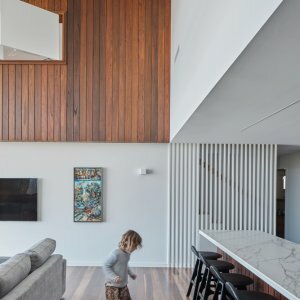 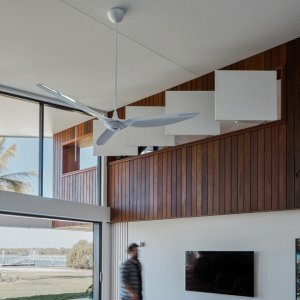 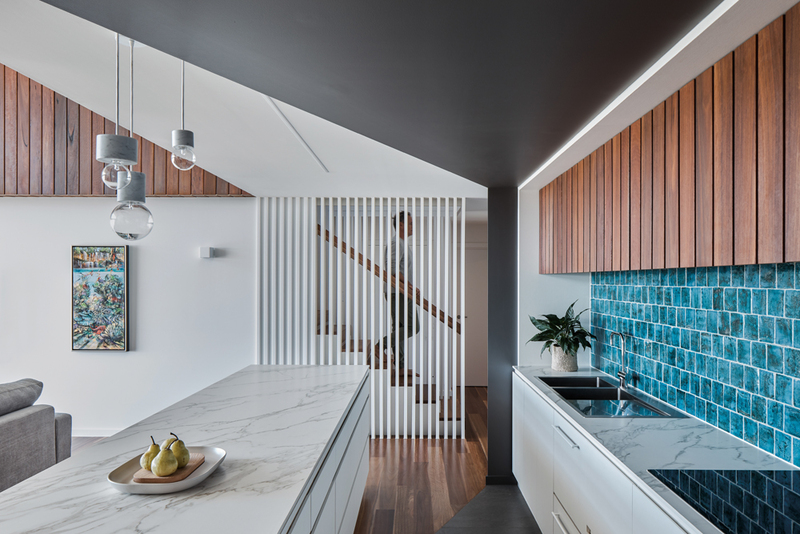 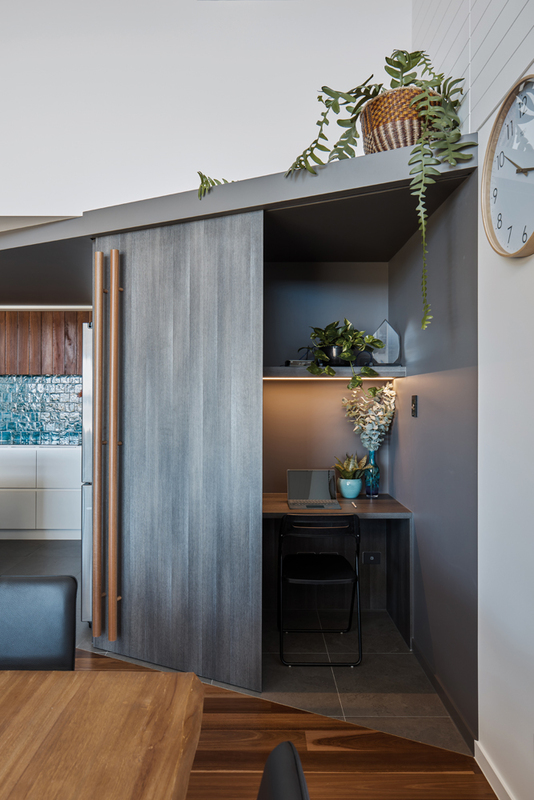 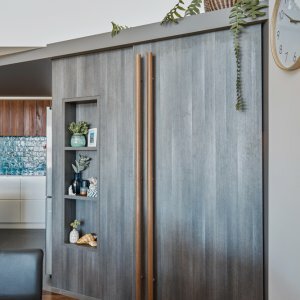 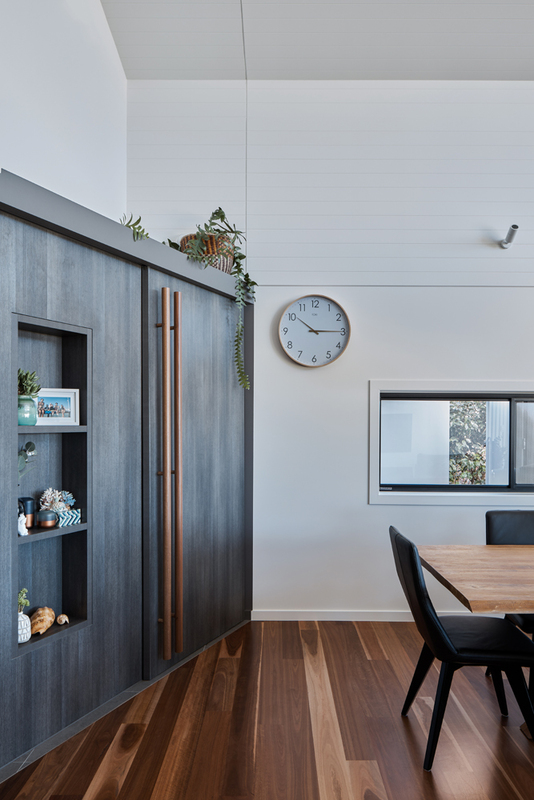 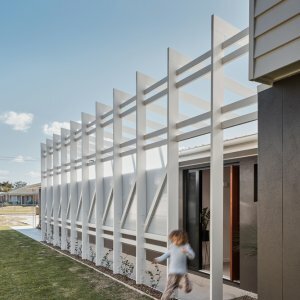 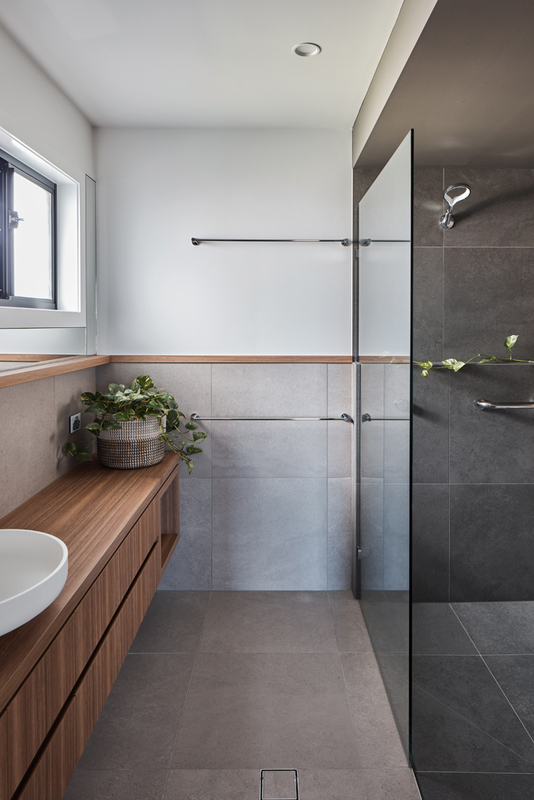 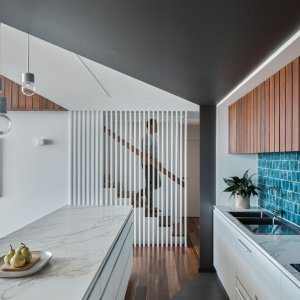 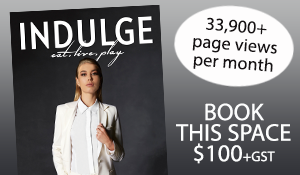 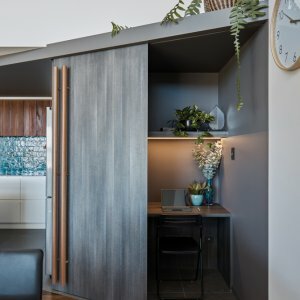 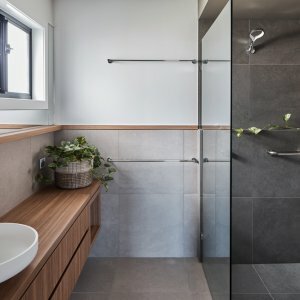 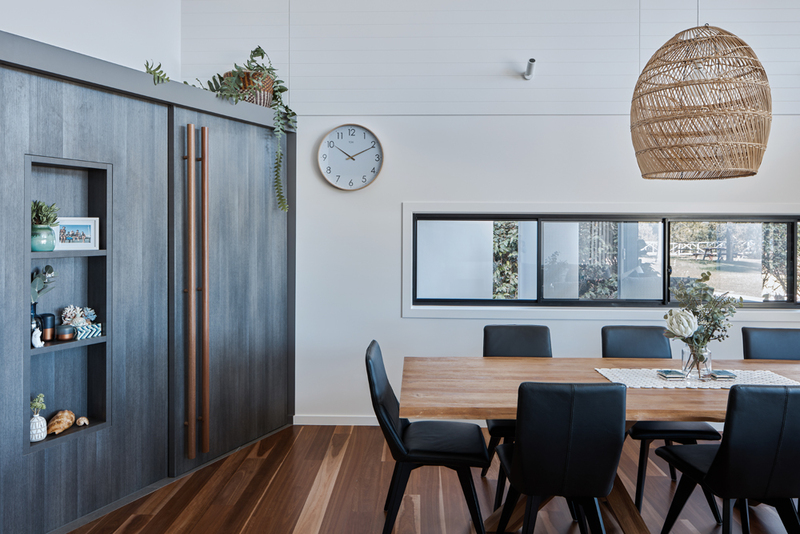 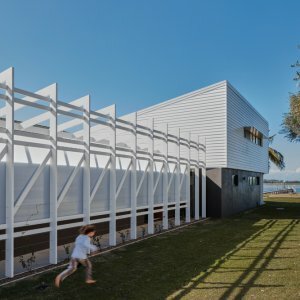 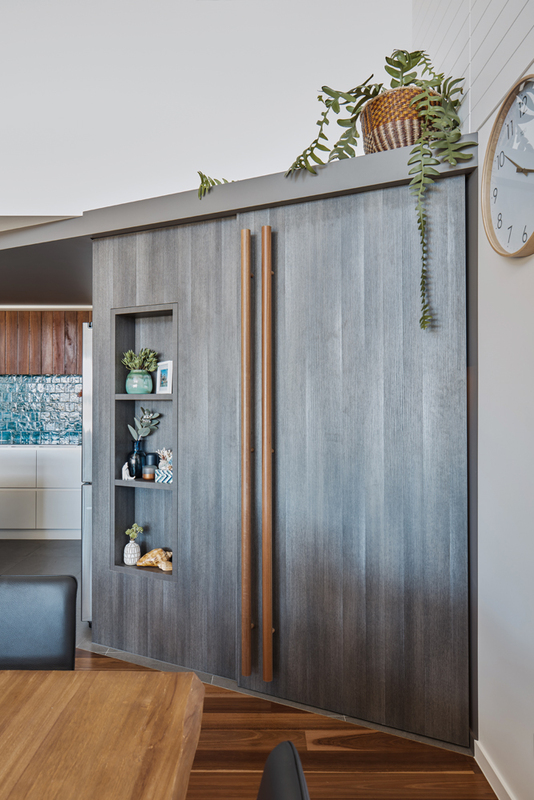 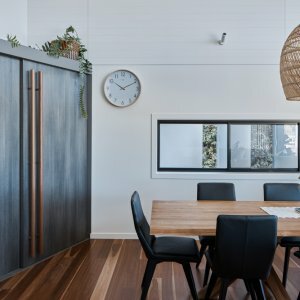 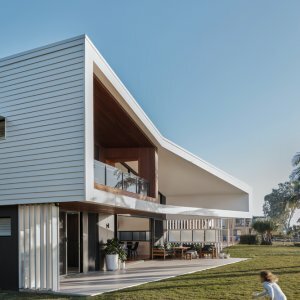 A testament to the property transformation, the home was awarded as one of three Finalists in Best Renovation/Addition $600,000 to $ million category from more than 50 entries at the Housing Industry Association Queensland Housing Awards in 2018. 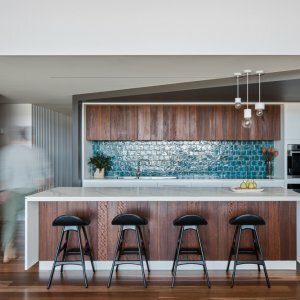 The restoration was overseen by Justin Humphrey, a Gold Coast based architect with a knack for creating unique and purposeful designs. 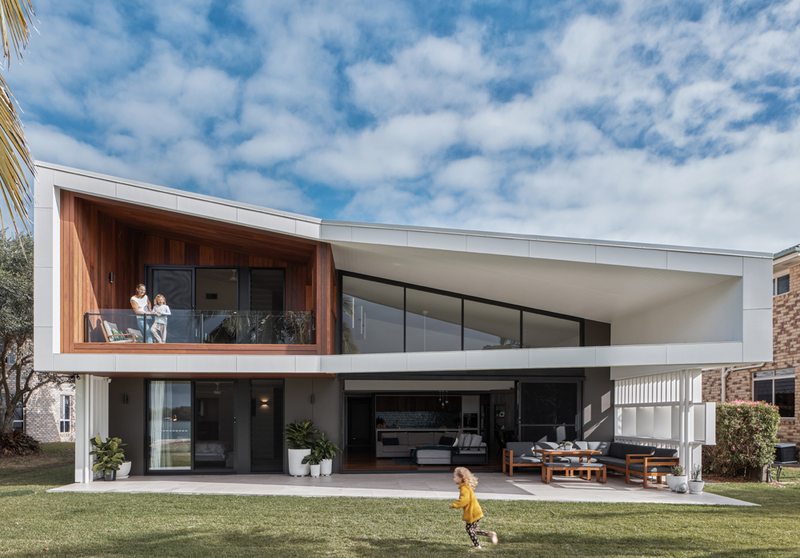 Having previously worked on many coastal projects for Paul Uhlmann Architects, Humphrey understands the importance of both accommodating client needs and respecting the site environment. 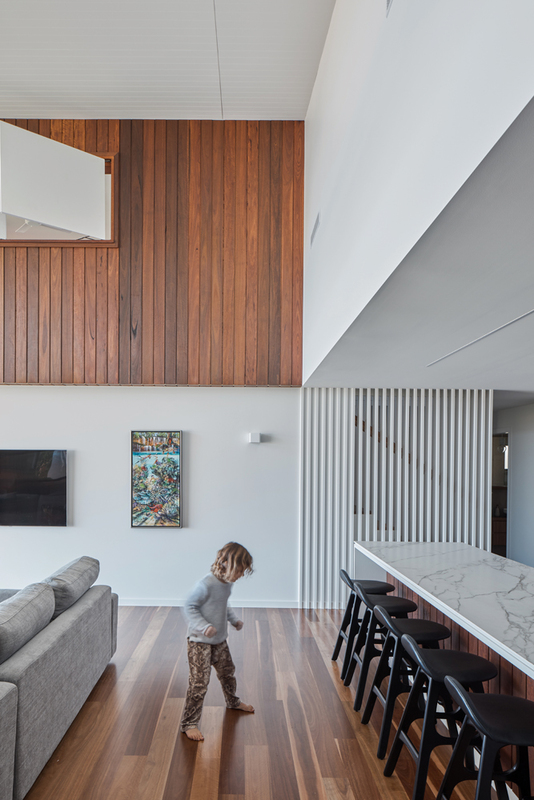 The design involved reprogramming the floor plan with complete respect for the orientation and conditions of the area. 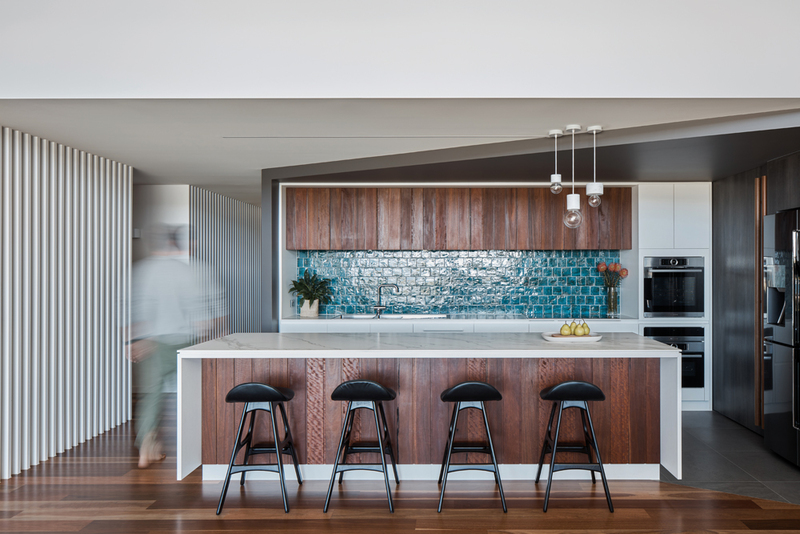 In redesigning the coastal home, the owners wanted to use the space as a retreat to create memories with family and friends. 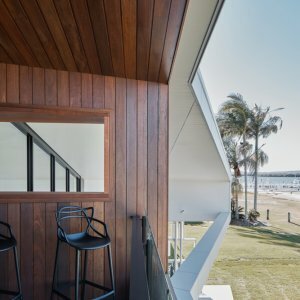 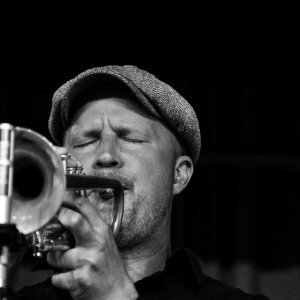 The connection to the bay informed the owners’ wish to respect the brick and water relationship while harbouring ample room for entertainment. 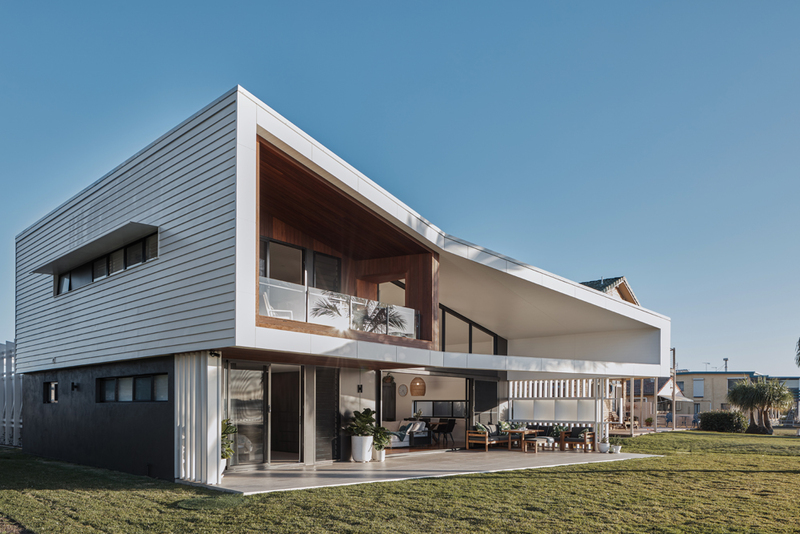 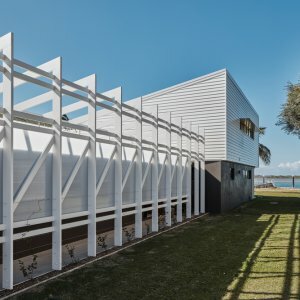 The double height indoor/outdoor living space and master bedroom allows an unending connection to the marine landscape, inviting in the sea breeze and salt spray, drawing an abundance of natural light. 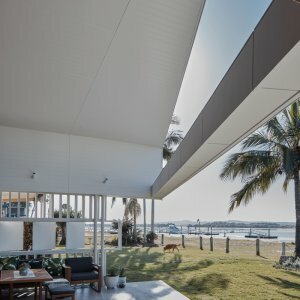 The outdoor covered terrace provides a dramatic volume of space imbued with a sense of intimacy. 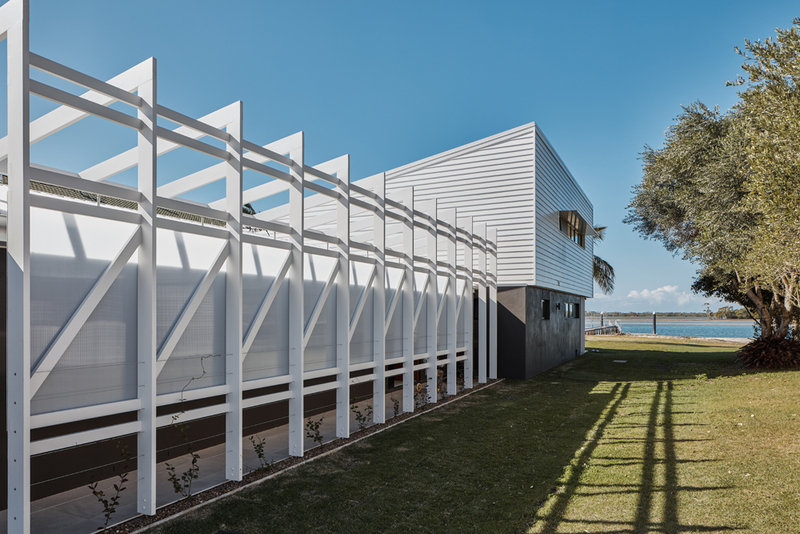 The dramatic roof lining reels out towards the ocean, providing greater protection from summer sun and rainfall. 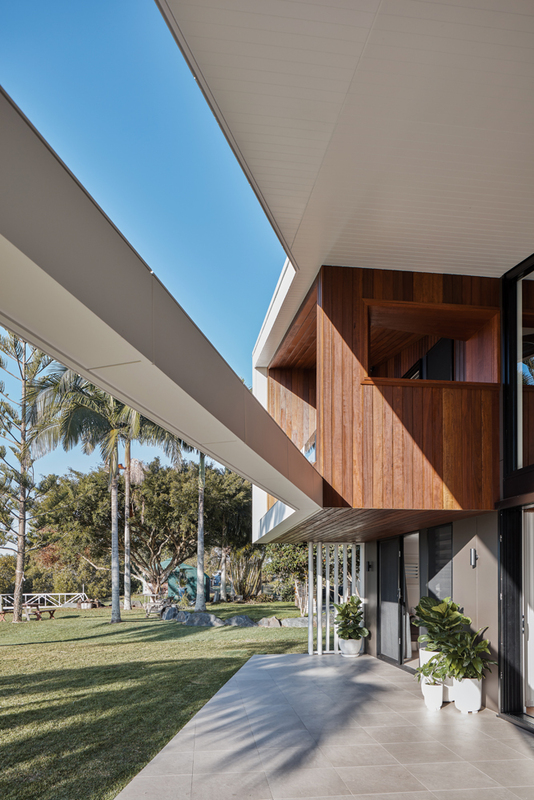 The lower edge of the exterior features an overhanging beam, reducing the scale of the outdoor terrace and making the large volume feel far more intimate. 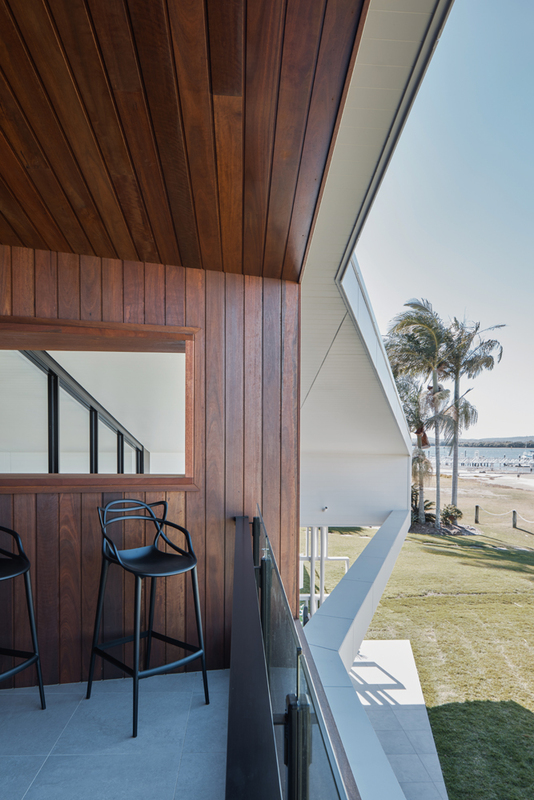 The hanger frames the shoreline for guests indoors, capturing a serene picture of the bay. 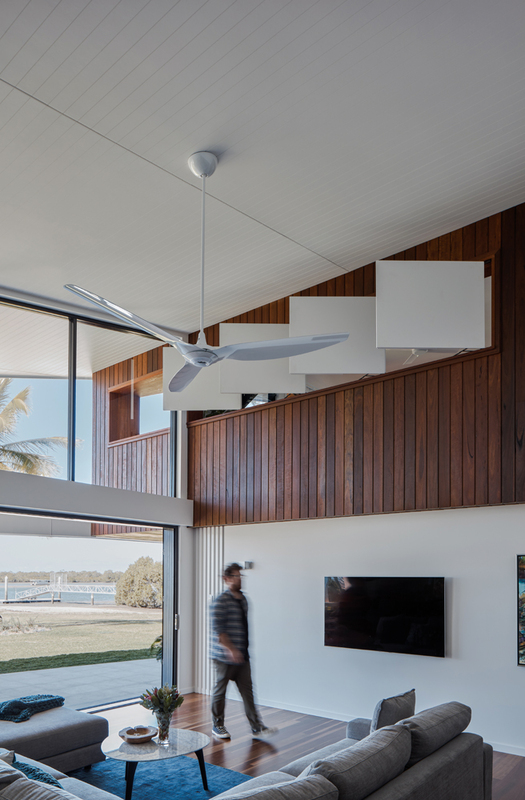 Internal vistas and connections between different areas of the main space were also important to establish. 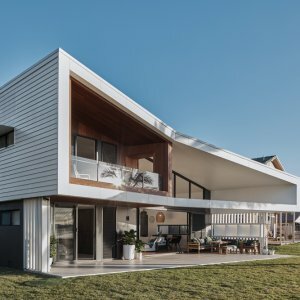 The designers were able to manipulate the floorplan with layers of screening and use of internal solid casement windows. 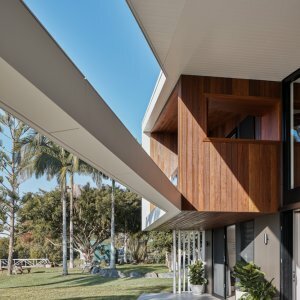 The windows provide a playful connection between different floors of the house whilst also adding a layer of privacy when the upstairs retreat is being used as a guest bedroom. 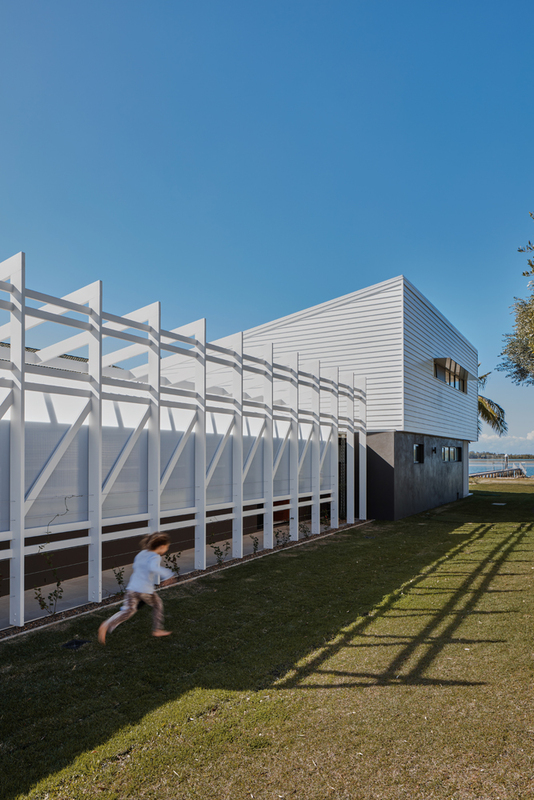 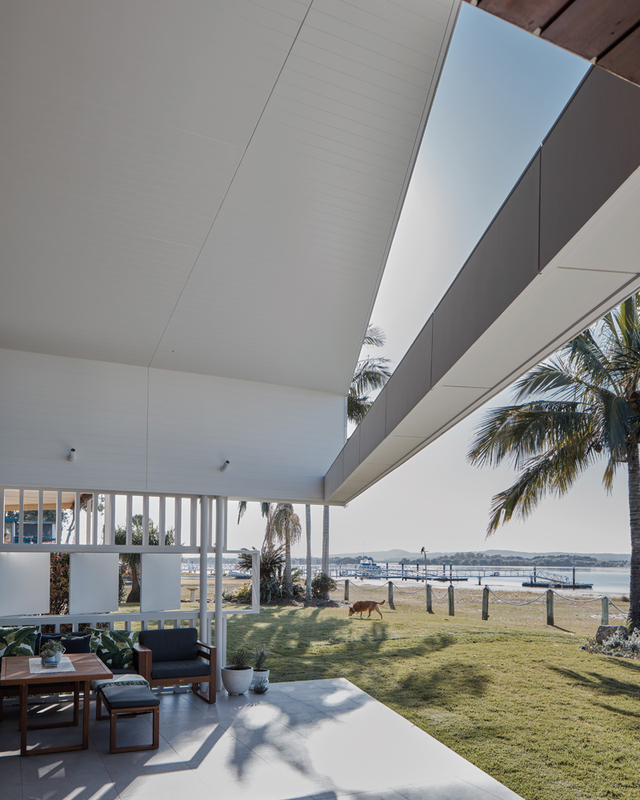 Cabbage Tree House showcases a harmonising respect between the residence and the surrounding seaside community. 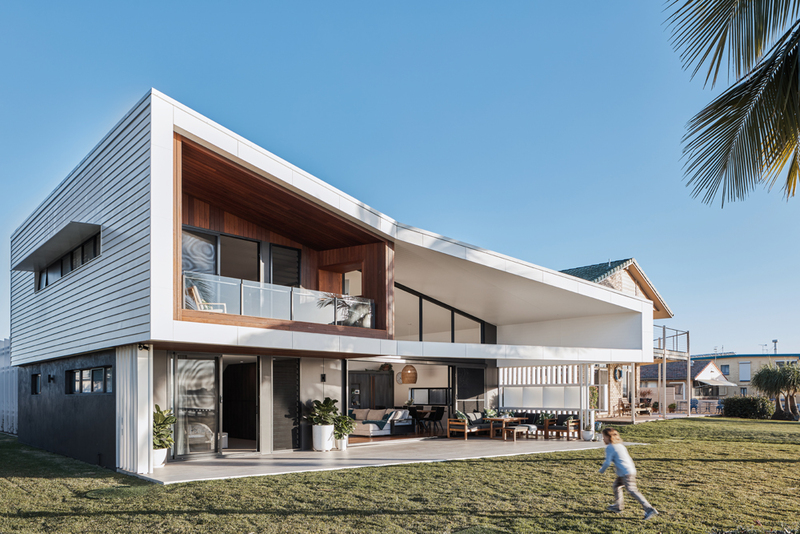 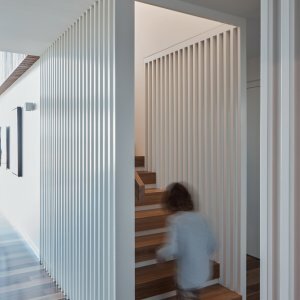 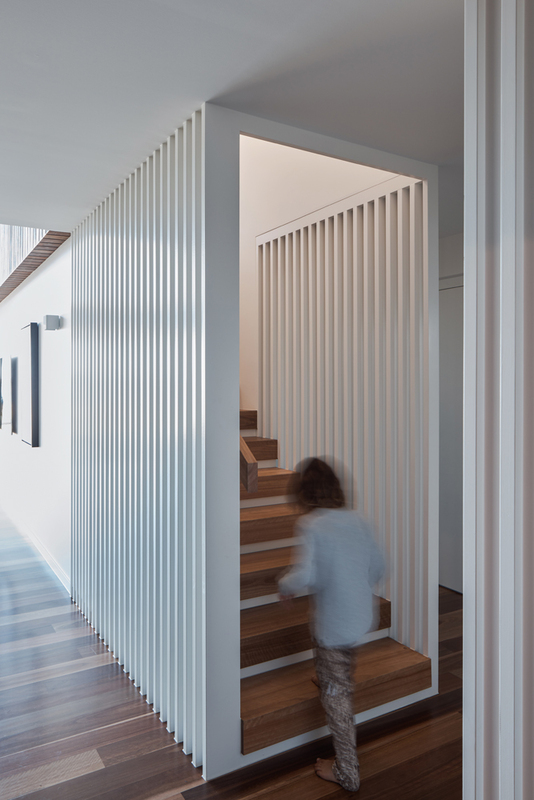 Though refurbished and reinvigorated with a modern design, the home sits comfortably among its coastal neighbours, appearing warm and inviting to neighbours and locals alike. 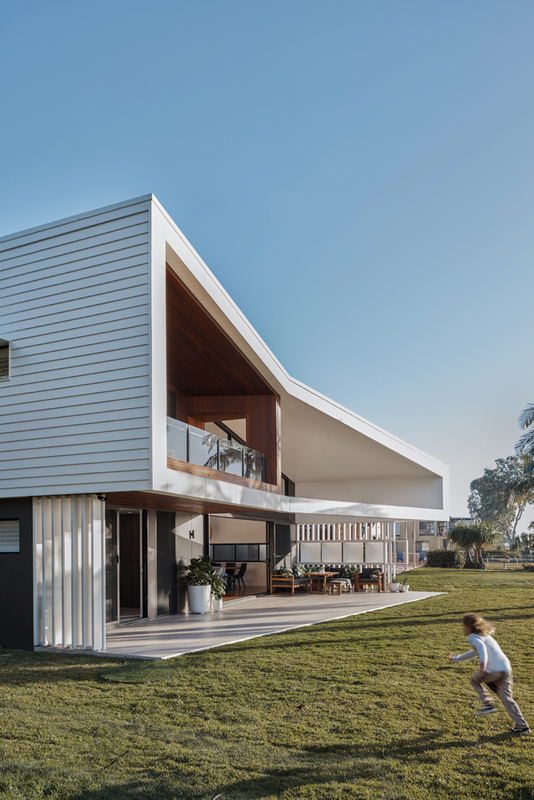 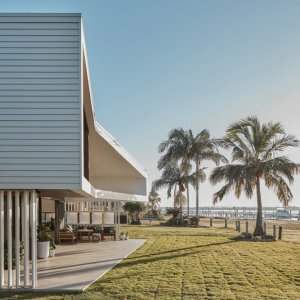 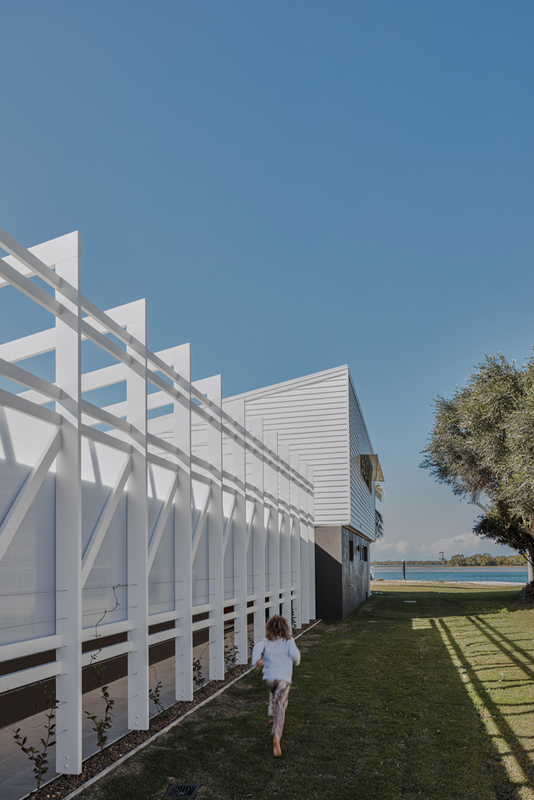 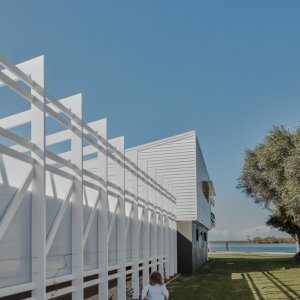 Edged by manicured lawn and tall palms, the white, grey and warm timber form of the house sweeps upwards to the sky in a grand gesture — almost a piece of sculpture by the sea. 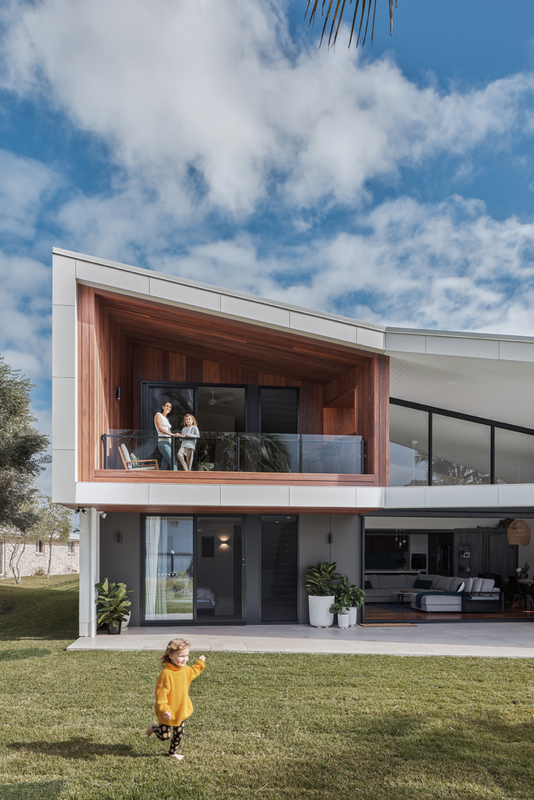 Readers also enjoyed this story about this Jetsons inspired home.